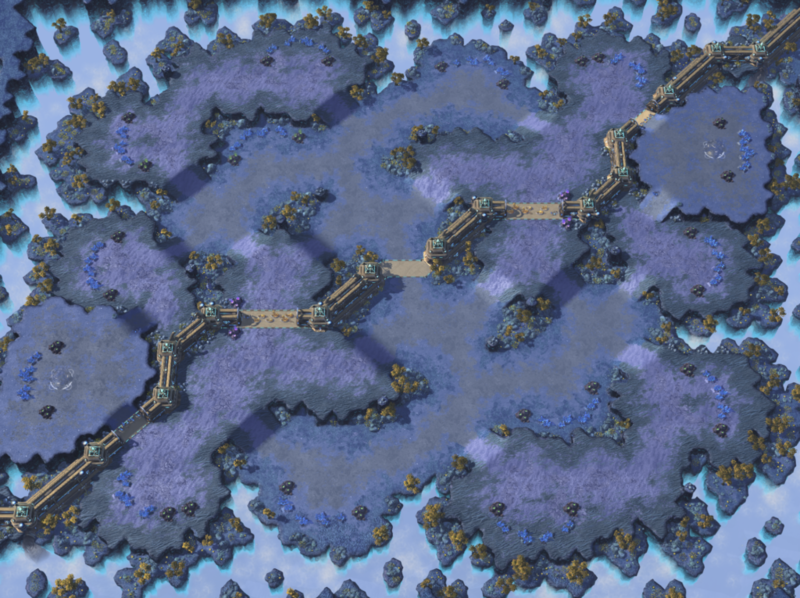 This map has been made for the Teamliquid Map Contest 12 for the Challenge #1 – “There is something in the way”. This contest is organized by Teamliquid at the request of Blizzard Entertainment. This map embraces the challenge in many ways. The first important feature of the map is that there is only one small path between each half of the map located in the middle. There are four (two on each side) points in the map where players can open additional paths to the other half. Each opened path changes drastically how players can attack the opponent or defend their part of the map. The first blocked path is located at the back of the starting base with four mineral fields on the ramp. Usually, blocked paths at the back of the starting base use destructible rocks which can be very easily destroyed by the attacker. Using mineral fields for a back path greatly reduces the attacker’s capabilities because he needs to bring workers to open up the path and those can be picked out easily. I expect it to give the defender a significant advantage when attacked and precise control when this path will be opened. 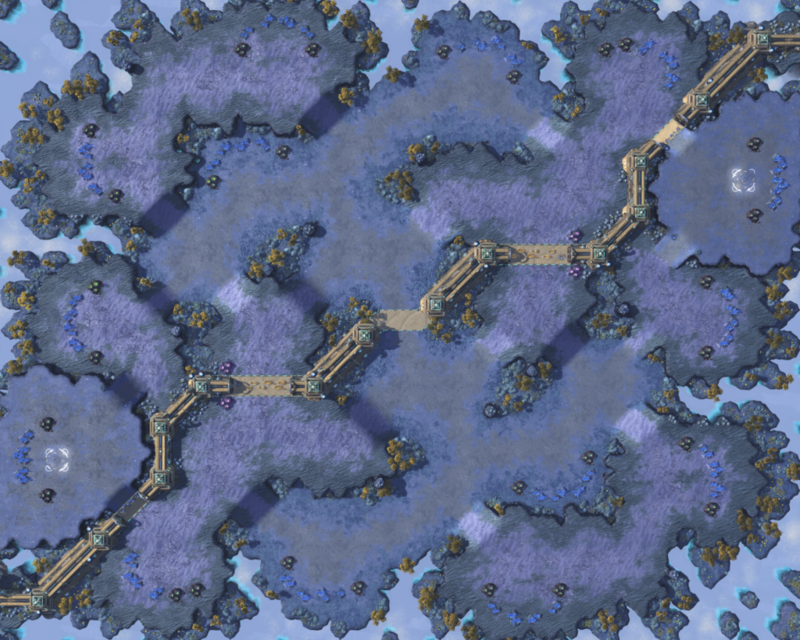 Opening this path gives both a great position to roam in the opponent’s half of the map but it’s also a weak point where the opponent can enter into the starting base. Maps with backdoor in the main base have a bad reputation because the few of those which used it, used it incorrectly. There is one mandatory rule that cannot be broken: The distance between the backdoor choke and the natural choke must be significantly longer for the attacker than for the defender so he has time to reposition. This map does it correctly because the attacker must go through the middle choke which is nearly twice the distance than the defender has to move. This also works once the reduced mineral field in the rich base is mined out. The second blocked path is located near the middle of the map. It is a full and rich expansion that also have a small mineral field so this path can be opened relatively easily. Opening this path gives a very useful forward position for the player which can quickly defend on both halves of the map. The normal starting base ramp is also enlarged and has a reduced mineral field. This is placed intentionally to let the defender move a bigger army more easily between the expansion base in front and at the back. The mineral fields at the back of the starting base have a value of 55. This value is chosen because there is a super worker (a Mule) that can gather resources in chucks of 25. So the attacking player requires to use 3 mules and one normal worker or 2 mules and one normal worker or 11 workers. There is a trick for the attacker where he can use the gas geyser nearby to get rid of the minerals in the hand of the workers. This enables to use a lot less workers to open up this path. The small mineral fields at the front of the starting base and inside the rich expansion have a value of 30. It requires 1 Mule + 1 worker or 6 workers. These values are chosen so the players can open these paths more easily. – https://i.imgur.com/Nn5qe2v.mp4 Blink Stalkers cannot teleport inside the starting base from the back because of the precise placement of the mineral fields. – https://i.imgur.com/sUIU0AV.mp4 Two Queen units can block the entrance to the starting base. – https://i.imgur.com/iv00OIl.mp4 A classic wall works for the regular starting base entrance.